Notes: Turner F18 "cairn, it does not appear to have been excavated, although there is a slight disturbance at the top centre where large granite stones are bared. 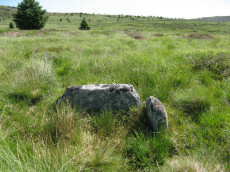 At the north west extreme are two stones, the positions of which indicate this being part of the retaining circle, no others remain. Height 0.8m, diameter 5.0m." Notes: Turner E26. Dixon #62. Bar Rep 54. Butler Bellever Tor (Cairn 1) - Vol. 2. Map 27.20.1 (diagram pp.52-3). Grinsell LYDFORD 59. For further coverage see the Lakehead Hill page. Lethbridge diagram p.119 (uppermost cist) and photo top p.119. Notes: Turner A50. "Cairn visible as unbroken circular bank 11.5 metres in external diameter with a bank 2.4 to 3.7 metres wide by 0.75 metres high enclosing a flat platform circa 6 metres diameter and 0.5 metres above ground surface. 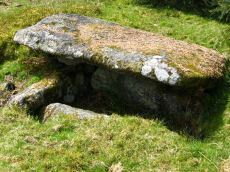 Some small stones appear in the north and east margins, and several larger stones are visible on the platform." 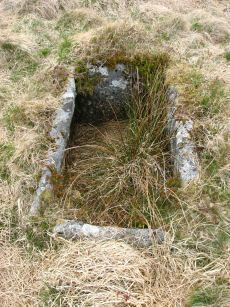 Lethbridge diagram p.119 (Cairn near Cist 1) - no photo. Notes: Turner D4. Dixon #79. Bar Rep 57. Butler Bellever Tor - Vol. 2. Map 27.20.6 (Cairn 6 diagram pp.52-3). Grinsell LYDFORD 62. Further coverage on Lakehead Hill page. Lethbridge diagram p.119 Cist 2 and photo top p.120. Notes: Turner D7. Dixon #80. Bar Rep 59. Butler Bellever Tor - Vol. 2. Map 27.20.8 (Cairn 8 diagram pp.52-3). Grinsell LYDFORD 64. Further coverage on Lakehead Hill page. Notes: Turner D5. Dixon #78. Bar Rep 57. 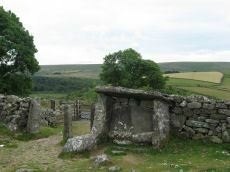 Butler Bellever Tor (Cairn 3) - Vol. 2. Map 27.20.3 (diagram pp.52-3). Grinsell LYDFORD 60. Further coverage on Lakehead Hill page. Lethbridge Cist 1 diagram p.119 and photo top p.119. Notes: Turner E37. Dixon #81. Bar Rep. 58. Butler Bellever Tor (Cairn 9) - Vol. 2. Map 27.20.9 (diagram p52-3). Grinsell LYDFORD 65. Lethbridge Cist 3 diagram p.119 and photo bottom p.120. Notes: Dixon #87. Bar Rep 59. Butler Bellever Tor - Vol. 2. Map 27.20.10 (Cairn 10 diagram pp.52-3). Grinsell LYDFORD 66. Only one side of this cist remains. Further coverage on Lakehead Hill page. Lethbridge Cist 4 diagram p.119 and photo top p.121. Notes: Butler Laughter 1. Double row interrupted by a new-take wall. row is robbed near wall. "Bronze Age standing stone 2.65 metres high, 0.7 metres wide and 0.52 metres thick, set into a small cairn. 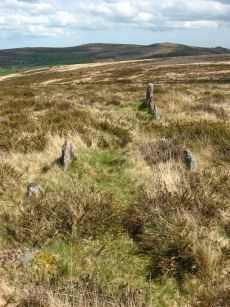 About 18 metres to the south east is a double stone row orientated north west to south east and consisting of at least 23 upright stones and a further 9 displaced ones averaging about 1.7 metres apart. 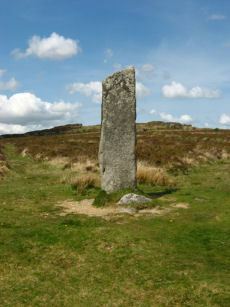 The standing stone was re-erected in 1893 and again in 1911 and the cairn was excavated in 1903". Lethbridge pp.121-122. Notes: Butler Laughter 2. "A double stone row at about 395m OD cuts across the gentle SW projecting spur of Laughter Tor in an area of heather and rough grass some 12m WSW of the standing stone 'Laughter Man'. The stones, although all relatively small in size, form two good slightly curving rows oriented about 295 degs. and 0.7m to 1.2m apart, consisting of thirteen stones extending from SX 6519075381 some 15m ESE to SX 6520475375. Now visible are six stones in each row with a single stone at the NW end. Originally there may have been at least ten in each row at intervals of about 1.2m". Lethbridge pp.121-122.